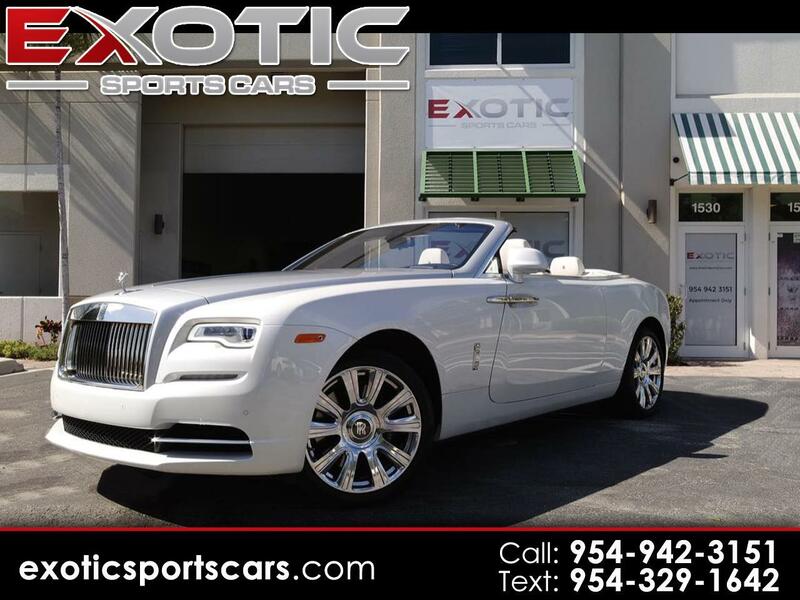 Exotic Sports Cars is very proud to present this absolutely beautiful White on White, 2016 Rolls Royce Dawn. Custom and Rare Moonstone Gray Top with a matching hood and polished chrome wheels finish off this elegant and sophisticated highline automobile. This vehicle has a clean CarFax and is still under a full manufactures warranty covering absolutely everything except batteries and tires until May 2020. We took the liberty of replacing the tires with brand new ones because anyone buying a Rolls Royce deserves nothing but the best. The 6.6L Twin Turbo V12 with produces 563 hp and gets this 2 door convertible from zero to 60 in 4.9 seconds. The sound system has a full active 18-channel amplifier, 1300 watts maximum power with 16 loudspeakers, 2 exciters in the headliner, studio setting for real, pure original sound and theatre setting for perfect surround sound. Automatic controlled microphone volume and tone adjustments while driving change the music according to the ambient noises. Message: Thought you might be interested in this 2016 Rolls-Royce Dawn.